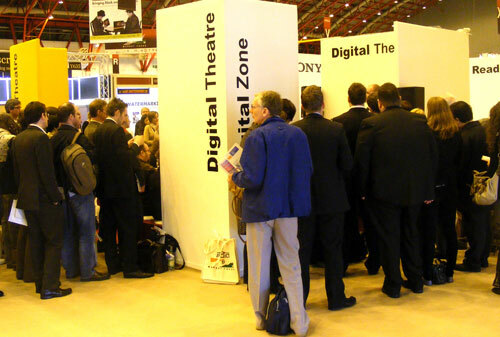 The Digital Zone and Theatre sponsored by Sony has brought the discussion about e-books onto the show floor of the London Book Fair, (April 20-22). Previously talk had mostly been in smaller spaces discussing possibilities in the future. Last September Sony launched hardware in the UK supporting the EPUB format, previously little known. Waterstones, a UK chain of bookshops, has promoted the Sony Reader in most towns though not in all branches. Stocks were very limited towards the end of 2008 but are now meeting a continuing demand. There is no announced date for a UK launch for the Amazon Kindle, the major device that is not yet supporting the EPUB format. At a seminar held in the spacious Cromwell Suite, Richard Palk from Sony claimed that EPUB is now the "format of choice for UK consumers". He later mentioned other devices such as downloads for the iPhone. Stanza was part of the Digital Zone and the software for the iPhone also supports EPUB and there have been over a million downloads from the Apple store. Palk did not give specific numbers for the UK but stated that the Sony Reader has sold over 400,000 on the planet. So there are no clear numbers for the UK but it is possible that EPUB could become a standard as there is no sign of an alternative from Amazon and the Kindle may have to be extended to EPUB to avoid customer confusion. "Confusion" is the term used in panel discussions to describe consumer impatience with conflicting formats that seem not to offer any advantages for consumers. There is more about EPUB from the seminar on video posted to YouTube. 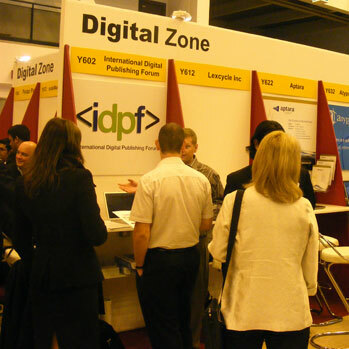 London publishers seem to accept the case for EPUB made by the International Digital Publishing Forum (IDPF), also part of the Digital Zone. Executive Director Michael Smith, as reported by Publisher's Weekly told a conference held just before the Book Fair that that "the open source reader software, which reflows text to accommodate virtually any device, needs some tweaking. But with adoption growing in the US, the UK, Germany and with inroads being made in France and elsewhere in Europe, EPUB is poised for significant adoption." Publishers Weekly reporter Andrew Albanese took the view that digital publishing is still a minority interest, but he expected it could "move toward the center of the show floor in coming years -- and for next year's Digital Zone and Theatre to have more than two dozen seats" because of the overflowing crowds on this occasion. The seminar identified several issues that still need to be worked on. Steve Potash from distributor Overdrive stated the current prices are a barrier for a mass market and raised the question of when Sony could reduce them given the current costs of screen technology. Neil Jewsbury from Waterstones would clearly welcome a wider range of available titles, including the backlist. My impression is that the campus branches of Waterstones are less likely to stock the Sony Reader than those in city centres. This may be because so far few titles are available as EPUB from academic publishers. Genevieve Shore from Penguin has found that the display on the Sony Reader is currently best suited to continuous text. Any complicated design can be an issue. EPUB is currently at the approximate design level of a paperback in the 1930s. O'Reilly mostly promoted printed books on their stand but the blog for Tools of Change recently reported the "Open Publishing Distribution System" that could make a major difference to the speed of adoption of EPUB titles. The catalog system is based on Atom and extends the software started by Stanza. Adobe and the Internet Archive also support the approach. It can be used for content with Digital Rights Management or in public domain. In theory this could work as easily as the way that blogs are distributed. The EPUB format is based on open standards such as XHTML so there could be more Web content converted for offline reading. The worlds of published print and Web document sharing may coexist though subject to further discussion. Genevieve Shore from Penguin welcomed the sites where authors can try out ideas or release early chapters of a new project. Journal publishers recognised that academics sometimes post early versions of papers online and this is now part of many formal contracts. However, there was some concern about the way that content then appears on other sites. I spoke to people on the Scribd stand who told me that they are able to work with publishers to create a database of texts that are then protected and will be recognised if attempts are made to load them. Scribd are working with some publishers who post extracts or promotional texts and this may be the way forward for combining traditional publishing and current Web culture. The panel considering the Sony Reader considered that in the US e-books are still around 1 percent of income for publishers and it may take a while to reach the same level in the UK. However, as more books are bought online the change in behaviour to paying for a download is not that great.